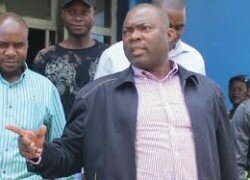 THE stoning of my motor convoy by mealie meal smugglers at Kasumbalesa border post in Chililabombwe will not discourage me to perform my duties and I will not tolerate the illegal exportation of the commodity, says Copperbelt Province minister Bowman Lusambo. On Saturday, Mr Lusambo and his entourage were stoned by suspected smugglers in Chililabombwe after he unexpectedly went to inspect the Kasumbalesa border post to get first-hand account of the extent of mealie meal smuggling taking place through the post around 02 :00 hrours. Mr Lusambo has warned that he would not relent to carry out his duties and would ensure that justice and law took their course by ending smuggling in the province in which, he said, Government was losing huge sums of money in uncollected tax and loss of produce. “We are not going to look on political status but my mission is to ensure that sanity is brought in the border town of Chililabombwe and Copperbelt as whole in terms of smuggling. I am determined to end the vice this is why I was not alone when I went for inspection but in the company of the permanent secretary and the police command and we will bring this vice to the end no matter what,’’ he said. He noted that there was need for President Edgar Lungu to sign a Statutory Instrument ( SI) to ensure that those transporters involved in the smuggling business would be barred and their goods and vehicles forfeited to the State. This was necessary if the country was going to have food security. Mr Lusambo said he would continue working with security personnel to ensure that no mealie meal left the country illegally by sealing loopholes. He conceded that manpower was currently overwhelmed and needed to be beefed up because the long border between Zambia and DR Congo was porous and criminals were using bush tracks to smuggle goods. Mr Lusambo said he would still go back to the border and would continue to conduct such operations to ensure that the illegal business came to an end. He urged Zambians not to be involved in dubious businesses. “I am aware that the shops which used to be groceries in Chililabombwe were now operating as warehouses for mealie meal storage. Very soon I am going to do a clean-up in the area and anyone found wanting will be prosecuted because we mean serious business and nothing will derail me to execute my duties,” said Mr Lusambo.